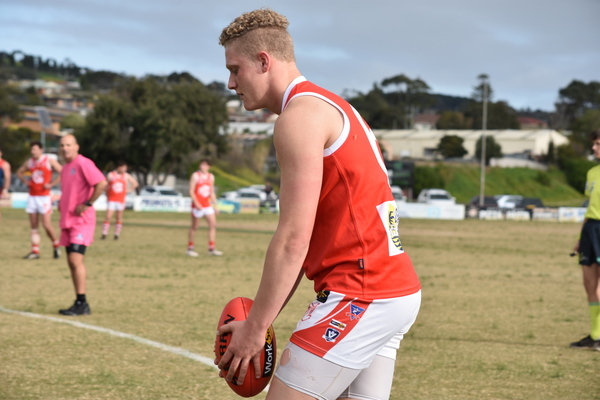 Star Grubber teenagers Tom Richardson and Harley Pearce performed well in their senior debut after Ocean Grove scored a comfortable 70-point win over Portarlington on Saturday. Final scores Ocean Grove 16.23 (119) defeated Portarlington 7.7 (49) at Ron Evans Oval. Ocean Grove sits in fourth spot with an 8-5 record after 13 rounds. Richardson, who plays Ocean Grove Under 17s, while Pearce, the Under 19s Grubber co-captain, both kicked goals. Richardson, who booted two majors, is the son of former Grubber goalkicking ace Adam Richardson, also an ex Drysdale player. Adam, a dual Ocean Grove premiership player in 1994-95 who bagged 121 goals for the Grubbers in 1995, played two senior AFL games for Adelaide in 2001. 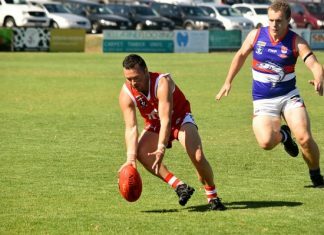 Ocean Grove coach Paul Lynch said it was a thrill for both players to taste victory in their first senior BFL game. “It is a big day for any kid playing their first game of senior footy. I thought both acquitted themselves pretty good,” Lynch told the Voice. While it was a much-needed victory, the Grubbers failed to resolve their goalkicking woes. At quarter time, the Grubbers kicked a wasteful 2.11 and Lynch said it was matter of time before it cost them the match. “It happens a lot, that is the problem, we kick a lot of points religiously – so it is an area of our game we have to get better,” Lynch told the Voice. “They have to practice to get better – it is going to cost us one day. An inaccurate Ocean Grove dominated after half time with 11 goals – including a seven-goal third term blitz. Pacey midfielder Jahd Anderson was a standout in his 50th senior game, while Andrew Jarvis had a strong impact in the ruck. Grubber sharpshooter Jake Carmody finished with four goals and Luke Cartelli shined with three. Backman Justin Carey sustained an ankle injury. Lynch hinted some of his key players would be available for selection against ladder leader Barwon Heads. “We will get four or five back after the bye – I have been waiting for that and we had an ordinary run with injury,” Lynch said. Barwon Heads has won their last eight Battle of the Bridge clashes against Ocean Grove – the Grubbers last victory over the Seagulls was Round 14, 2014. “They are the benchmark Barwon Heads – I have got some ideas how I want to play against them,” he said. Goals: J. Carmody 4, L. Cartelli 3, T. Richardson 2, I. Wilkins, H. Pearce, T. Gavin, L. Taylor, M. Caldow, C. Marchbank, J. Linton. Best: J. Anderson, A. Jarvis, H. Walker, I. Wilkins, J. Linton, L. Cartelli. Next articleWho is your club legend?